If “product crushes” were a thing like celebrity crushes, mine would be Notion. In any case, it was dubbed the app to watch in 2018, with good reason. The company isn’t even a few years old and has already started to reshape how we work, collaborate and store information. When I discovered Notion completely by accident on (in?) the App Store about a year or so ago, I was blown away. I hadn’t been this excited for a product since my first iPhone. Something to note: no, I’m not getting paid to write about Notion and I have zero affiliation with them whatsoever. I just genuinely love this product so much – and I think you will, too. Slow down, Speed Racer. What the heck is Notion anyway? Create wikis, to-do lists, reading lists, project plans, budgets, photo galleries, blogs – yes, really anything. Plus, it’s available on desktop, iOS and, most recently, Android. Think about it this way: your digital life is probably strewn about in your Google Drive, Evernote account, email inbox, Trello boards…you get the idea. 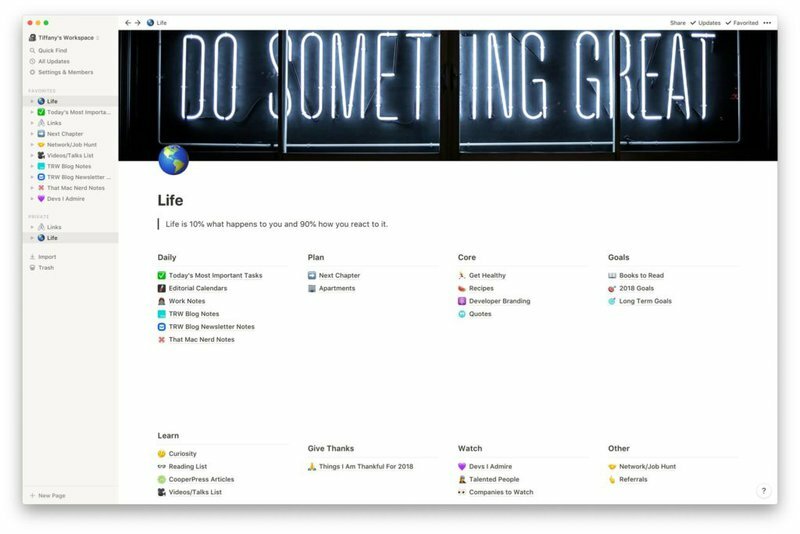 Some people might like to create editorial calendars and blog posts in Notion, others might prefer to just store recipes and YouTube videos they want to watch later. Basically, you can make your Notion workspace as complicated or as simple as you’d like. You can include your personal content as well as professional content in the same space, but still keep them separated – such as the screenshot below. As you can see, the product is clean, crisp and easy to navigate – but still has everything you could possibly need in your digital life. Each of those lines of text open up to pages that contain all of the information you want – whether it’s a spreadsheet, calendar, blog post or even a kanban board. But let’s go a bit deeper. Sure, I’ve briefly explained what the product is at its surface, but let’s dig into what you can do with it. And it’s true: there are plenty of amazing examples of people using Notion in incredible ways. Similar to Airtable Universe, though much more lightweight, is Notion Pages. From a curriculum sample to a virtual bookshelf, shown below, there are some incredible ways people are using this product. 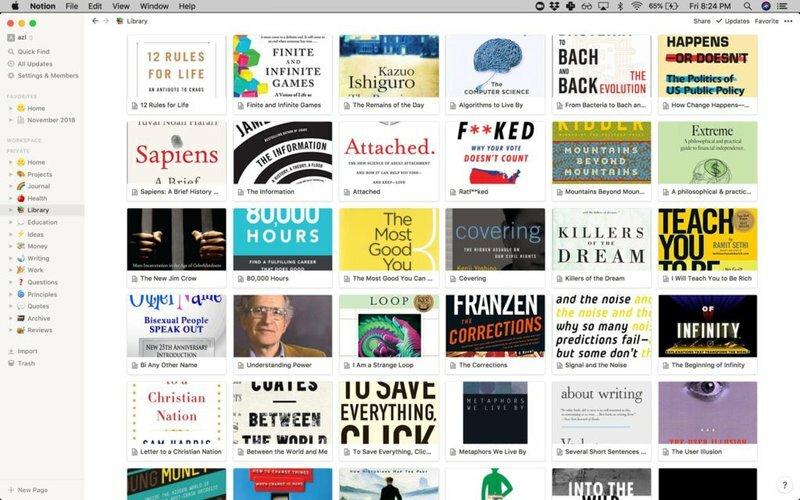 Personally, I use Notion as a running to-do list, an ideas board, a space for travel planning and as a way to organize links that I want to read/watch later. Wikis: Similar to a website, where you can create, edit and design your own layout. Documents: Open your documents and work completely offline. Tasks: Create tasks on new boards or design your own to-do list. Want to create a task and link it back to a blog post you’re writing within Notion (or even elsewhere)? You can do that. As we discussed in the last section, Notion can do pretty much anything you want it to. So, logically, it makes sense that this product can be used in a way that carries out similar functions of Trello, Google Docs and more. So that’s where they stepped in and created a space that combines all of these elements into one product. You can even use it as a wiki to share with people as a portfolio website, like this guy. But what if you want to use Notion as a team? This creates even more levels of awesome possibilities. If you want to collaborate with colleagues on a project, you can do so by creating roadmaps, kanban boards of deliverables, lists of resources and even upload prototypes or drafts that need feedback. No more sharing Google Doc links back and forth, no more separated Trello board from your workspace. While there are some people out there who aren’t fully convinced that Notion is there…yet, it’s just a matter of trying it out for yourself and seeing how it fits into your workflow. There are plenty of resources out there to get you started, from this one to this one, plus some unique ideas for other things you can build in Notion.